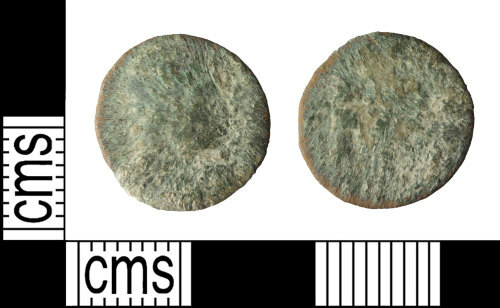 A copper-alloy Roman nummus of the House of Constantine dating to the period AD 335-341 (Reece period 17) GLORIA EXERCITVS reverse type depicting two soldiers, one either side of one standard. Uncertain mint. Obverse description: Rosette-diademed, draped, cuirassed bust right. Reverse description: Two soldiers holding spears and shields with one standard between them.